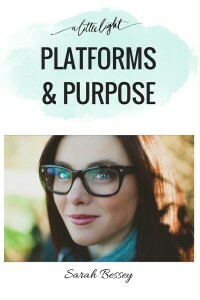 Welcome to another Platforms and Purpose interview, where we chat with Canadian women about how their faith plays into the work they do with their online and offline platforms. Today we are featuring Sarah Bessey. She is a bestselling author, wife, blogger, Jesus-loving, minivan driving, speaking, preaching, Doctor Who quoting, mother to four. She is a self-declared ‘recovering know it all’ which echoes the foundational theme of her new book, Out of Sorts. We are fans of her lovely writing and we are very excited to share her generous interview with you. With all your years running your blog and online platforms, what is one area you always feel like a rookie in? I feel a bit out of my depth with live broadcasting thing. The new apps like Periscope seem like a great idea and I see other bloggers/writers using them well but girl, that ain’t me. I am not a verbal processor and I find it terrifying. I’ll stick to the written word for now. My favourites are blogging, Twitter, and Instagram. I love blogging because it’s long-form writing and the ability to really connect through story. Twitter has expanded my world – I follow people from all around the world with such different passions and stories and interests that it makes me smarter and more informed. It helps me find my people and keep my fingers on the pulse of what’s going on in the world and in our hearts. It’s often deeply challenging and sober but it’s also way more fun than Facebook. People can be too intense and filled with weird moral outrage on Facebook. And Instagram is just lovely – good pictures, glimpses into each other’s lives, that sort of thing. You just welcomed your fourth baby (CONGRATULATIONS!) what is one thing (a product, a credo, a certain box of mac n cheese) that helps your momlife in some way? Oh, without a doubt, it’s my Ergo baby carrier. I bought it second-hand with my first baby nine years ago and it’s still going strong. I use it every single day. It’s wonderful for bonding and snuggling when they’re brand new but I find it’s worth its weight in gold when babies become mobile. They can get into everything and require a lot of redirection for a while there and so when I have work to do like cleaning the house or a phone call to make or making supper, I can just pop that baby on my back and get after it. They’re happy as clams because they feel close and held and wanted but I also have two free hands and full attention. I wouldn’t get anything done in my life without that thing. You are a blogger influencing readers online, you are also a women of action with a real life community. Is there a tension for you between online and IRL community? My online life and my “real” life are pretty seamless now. I feel like they work together well because I am the same person off-line as I am online. And I find that they feed each other. When I’m writing and leading well in an online space, that helps me to show up in my real life with more intention. And the same is in reverse. I can’t write about or through my life if I’m not living my life! For instance, writer’s block – that place where I’m feeling stuck and where I feel I have nothing to say – it’s usually because I have nothing that I’m living and nothing I’m experiencing and nothing I’m taking in. You can’t really write out of an empty well. That’s usually a big signal to me that it’s time to stop beating my head against the stone wall. So, for me, having a really rich well to pull water from is a pretty big deal. I can’t write about church and community when I’m not making time for church and community in my life. With this rise in ‘online life’ how do you see online community reflecting the community we are called to as Christians? I think it’s like real life – you see some reflections of amazing community and you also see the ways where we’ve kind of missing the point. Online spaces can sometimes be an intensified version of what we see offline because we’re a bit more concentrated. You have grown an international and loyal audience over the years. What practical advice would you give women in social media looking to build and engaged audience? I would encourage two things: relationships and generosity. I have been blogging forever and the relationships that develop are very dear to me, often becoming “real life” relationships. And not just with other bloggers – with your readers, too. Blogging/social media is much more of a conversation than a lecture or a sales pitch. Allow yourself to be changed and impacted by the conversation. And generosity is so counter to how most of us see things: we think we’ve got to hustle and hoard. Instead, I believe in abundance – there’s more than enough to go around – so elevate and amplify the voices of others, particularly those who are on the margins of conversations, celebrate others, cheer each other on, be on the same team. It’s a good seed to sow. You have a new book that was just released called Out of Sorts (which we’ve been proud to be on your launch team). Can you tell our readers about bit more about how you see this book helping women wrestling with the permission to ask bigger, bolder questions about their own faith? I think for too long we’ve confused certainty with faithfulness. We’ve been afraid of our questions or our doubts when the truth is that the Spirit is often waiting for us in that space. The point of our life isn’t to get to the end of it with the exact same opinions and preferences intact. Instead, I think that if we are paying attention to our lives, we will absolutely grow and change and evolve. Jesus is unchanging – Scripture tells us that he is the same yesterday, today, and forever – but we are always changing in response to that. I think we might be surprised where the Spirit will lead us. There’s an old proverb that says, “when sleeping women wake, mountains move.” I believe this book will help to wake up a few more of us and I’m excited to see what mountains will move as a result. You’ve been blogging, for like ever, and now have written two books. What did that it feel like to approach that threshold from ‘mom with a blog’ to ‘book writer’? Well, I was actually blogging before I became a mother! (I know, I’m from the dark ages of blogging. More than 11 years now back before social media changed how we engage online entirely.) But I never felt like I quite fit in any of the blogging niches – I wrote too much about Jesus to be a regular mom-blogger. I wrote too much about my questions and doubts and mess and struggles to be a nice-Christian-lady-blogger. I wrote too much about my tinies and my experiences as a mother to be a theological blogger. Basically, I just didn’t fit but what’s nice about giving up on trying to “fit” an audience is that you find out there are a lot of people who feel like they don’t fit. It turned out there were a lot of men and women who wrestled with faith and Church and theology while still loving a good story about family and life and raising kids. So when I began to write my first book, “Jesus Feminist,” it was from that threshold. I was writing it from my life, the big mess of theology and real life and diapers and the Kingdom of God all blended together. I began to call that alchemy “narrative theology” because I was always writing about what I believed and learned and experienced and even hoped about God and the best way I knew how to do that was through telling stories and finding the narrative threads in my own life. By the time I was at work on my second book, publishers and bloggers had long figured out that story-telling and theology actually belonged together and it wasn’t so weird anymore. Your books and blog touch on many issues. From motherhood, to social justice, to feminism, to asking questions about church and faith. How do you find a voice for these brazen issues that most shy away from? I could either blame or credit my family of origin. We loved a good debate. My parents always kept a newspaper in our house and so my sister and I read the headlines and opinions every day from the time we were quite young. We loved to talk about politics and hockey and the stuff of God! We were expected to have opinions. And so when I began to write my life out online, it was natural for me to wrestle with those very things. I never feel that bold or confrontational, I’m just telling my truth. I feel very strongly that a big aspect of my work is build pipelines for people. I want my writing to be an invitation to encounter God, not a slammed door of “my way or the highway.” I receive a lot of email from people rethinking their theology or their family life or whatever: I think that’s a tender time in a person’s life and I desire to shepherd people well in it. I believe you can speak a hard truth or challenge with love and welcome. But sure, some people will always be electrified by a woman who dares to speak her mind. You encourage women to follow their calling, despite motherhood and other life distractions and demands. Your quote: “we need to do the work we were meant to do in order to be who we were meant to be” really centers this thought. How do you encourage busy moms to make a point of pursuing their calling? God placed those gifts and callings inside of us for a purpose and it’s profane to stifle them in some misguided attempt at honouring God. If you want to honour God, come alive. It’s entirely right and appropriate to bring your whole self to your whole life. I think God created us for an abundant life, filled with joy and meaningful work and service. And I think it’s important for our children to see us working, to us loving our work (even the kind we do just for the fun of it, because it makes us feel alive). If teaching or preaching or writing or managing or leading or painting or film-making or delivering babies or studying astro-physics or whatever it is makes you feel more whole, then do it all to the glory of God and you’ll see that the way it makes you come alive will stain your entire life with joy. Because it’s never just about us. That true version of yourself – the one that needs the wholeness of creativity and work and service altogether – exists in a family and in a community and as part of God’s love letter to the world. When you are fully alive, as Ireneus famously said, it glorifies God. And when God is glorified, all of us are drawn to the light and life of that moment. It doesn’t have to be pretty. It doesn’t have to be seamless and easy. It doesn’t have to come together without struggle. In fact, I can pretty much promise you that it’s going to be hard at times to create the room for your calling to be lived out. But it will be worth it. Because if it makes you feel alive, if it’s what God gifted and called and created you to do right along with everything else in your life, then we all need you to do it and also you need to do it. What would you say to the women who feels a little lost in what her calling might be? What makes you come alive? What is that you would do for free or would even pay money to do? I think our callings are often hiding in our joy and also in our anger. Pay attention to what makes you angry or to what makes you joyful. There’s likely an invitation in there. A Little Light is a community of Christian women working to glorify God with their online and offline platforms. We are proudly Canadian! Find out how to join the community here.